A.P Govt. has released G.O.MS.No. 51. As per G.O No. 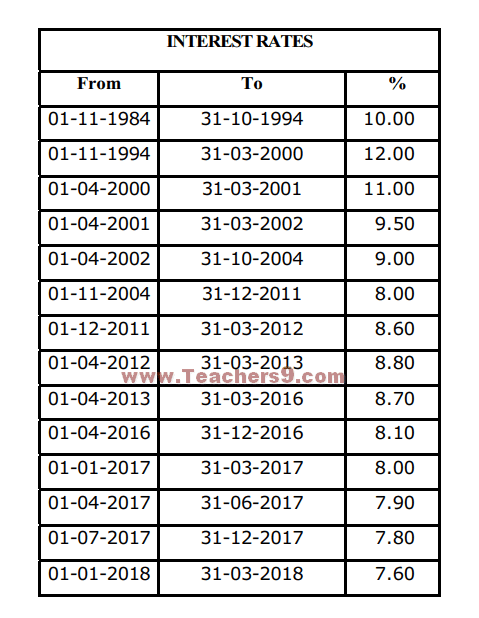 51 and File No.1690/138/A1/Admn.DI&IF/2016, Government hereby order that, the revised rates of interest on the Andhra Pradesh Group Insurance Savings Funds shall be allowed at 7.6% per annum as per the G.O Rt No.96 Finance (HR -5- Pension,GPF),Dep., dated :24-1-2018 and The Table for GIS subscription and with accumulated interest is issued for the periods covering from 01-01-2018 to 31-03-2018. Further, it is ordered that instructions prescribed at Para 4th above, should be followed scrupulously. The revised Table is annexed below.